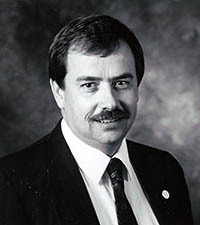 SEMA Hall of Fame - Jim Wirth, 2004, Wirth & Wirth Advertising. To label Jim Wirth a car fanatic would not do justice to his passion for the automobile. A quick cruise through his past reveals a history that’s immersed in all things automotive. Born into a family of car enthusiasts, he spent his early years riding around in rumble seats and touring cars. When he was just three years old, his father built him a gas-powered car using parts from old lawn mowers. Wirth drove the car in a St. Patrick’s Day antique car parade, towing a toy rocket ship. Around the time he was to get his driver’s license, Wirth spent an entire year helping his Dad restore a ’28 Model A pickup truck. It was during that project that he learned to respect the hard work and craftsmanship it takes to restore and customize a classic car. 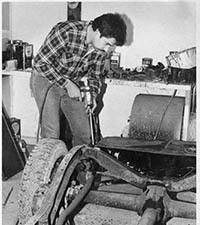 While his peers were hanging out, Wirth was degreasing engine parts, sanding fenders and handing tools to his Dad. By the late ‘60s he’d been bitten by the musclecar bug. At age 19, he was cruising the streets of his hometown in various big-block Chevys. And despite rumors to the contrary, Wirth contends that he always obeyed the traffic laws. Wirth’s enthusiasm for cars didn’t subside during his college years. His grade point average at Wright State University reflected the fact that he spent more time on his hot rods than on his studies. In July 1974, Wirth married his high-school sweetheart, Della. They rode from the church to the reception in a 1921 Kissel, as part of an antique car parade led by a 1923 Hupmobile that Wirth still has today. And what do you get a car crazy newlywed couple for a wedding present? A 1940 Ford coupe, of course. As would be expected from someone as passionate about cars as Wirth, his professional endeavors also centered around automobiles. He went from a part-time tire changer to service manager for a large Goodyear store at the age of 20. He went on to manage numerous transmission shops while simultaneously discovering the charm and challenge of scouring junkyards and garages for antique car parts. Together with his wife, Wirth would drive to swap meets with a trailer filled with antique car parts. In 1981, Wirth launched his own business, Wirth & Wirth Advertising—an automotive-only advertising company. His first real client was Kanter Auto Products. And while both companies have benefited from tremendous growth, they still enjoy a fruitful partnership. After having established a reputation for offering effective marketing and advertising services in the automotive aftermarket, the Wirths launched a second business, producing their own automotive swap meet. The Springfield Swap Meet & Car Show has grown to become one of the largest in the Midwest. Wirth’s involvement with SEMA started when he attended the SEMA National Management Conference in Scottsdale, Arizona. Impressed with the way members worked together to address industry concerns, Wirth suggested to Harry Hibler that SEMA consider embracing the antique and restoration industry. Hibler introduced him to then-SEMA President Chuck Blum and, not long after, the Automotive Restoration Market Organization (ARMO) was created. To date, Wirth has served three terms on the SEMA Board of Directors. The industry recognized Wirth for his hard work with numerous awards, including the SEMA Outstanding Achievement Award in 1993, the Hemmings Motor News Benefit the Hobby Award, also in 1993, and he was the first person ever inducted into the ARMO Hall of Fame. He was recognized as the number-one recruiter of new SEMA members in 1993 and was again recognized by ARMO with its Special Recognition Award in 2003. The Wirths continue to work together running both businesses and look forward to doing so for the foreseeable future.